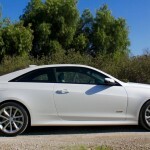 There’s a good chance you’ve read a review of the Cadillac ATS-V – it was introduced, after all, with an abundance of fan-fare. “M3-killer,” many quipped; “the best handling vehicle in its class,” others jeered. And here’s the truth: every bit of praise for the ATS-V’s performance is rightly deserved – this is a luxury-veiled super coupe that will sling around a track in the time it takes you to notice the wreath is gone from Caddy’s crest. If I was referring to the Chevrolet Camaro Z/28, that might be all you needed to know. 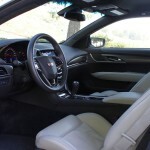 However, the ATS-V sits opposite a table of true luxury competitors, and as such, must prove it’s been through an equally-rigorous etiquette program as the established players. Fear not: if you came here to indulge in another helping of performance-inspired wordplay, I’ll get to that, but after spending a week with Cadillac’s prodigy, I’ve acquired a clearer picture of what owners are signing up for with the contribution of a $62,665 check. 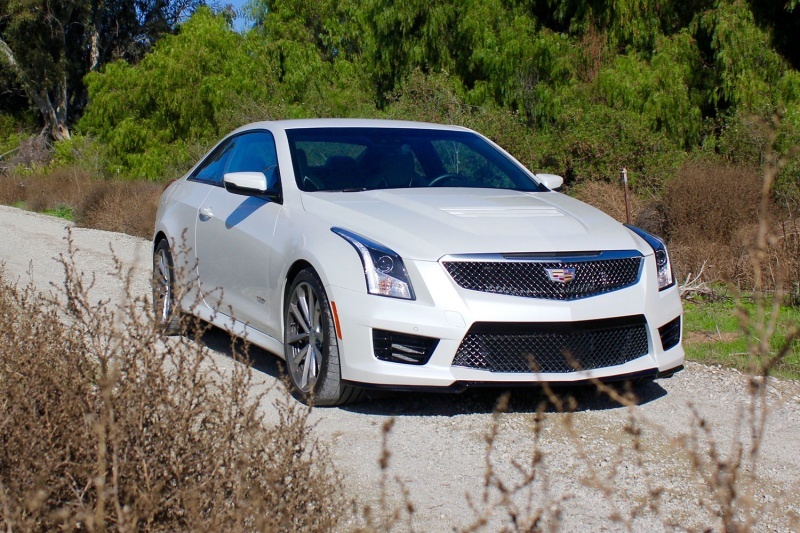 The 2016 ATS-V Coupe is hard to nail down in terms of exterior styling. There are obvious differences between the standard ATS and “ATS-Vroom” at the front (a ventilated, bulging hood, a black front splitter, and larger air intakes are all standard on the range-topper), but further back, the distinctions are far less pronounced. If the giant optional rear wing isn’t your cup of tea, only the quad-tipped exhaust and piano-black diffuser offer hints to rearward onlookers about the car’s twin-turbocharged tenacity. For many, the “sleeper” nature of the ATS-V’s aesthetics is a major draw – we all know officers are drawn like magnets to inflated, shouty performance cars. Indeed it feels like driving around in a 464 horsepower secret – by the time you know the truth, the “V” badges are just a blur. Unfortunately, the joy of obscurity can also be penance if you long for respect on local boulevards. 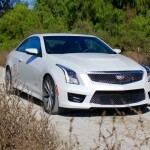 Whether you desire flash or appreciate modesty, the ATS-V Coupe is a handsome figure. Sleek lines, attractive wheel designs, narrow door mirrors, and deep-dished side sills combine for a mature stance. 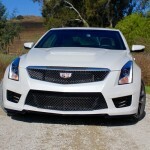 I’m reminded of the first-generation CTS-V that debuted in 2004 with just a touch of chrome, and a mammoth V8. 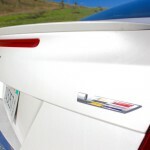 While Cadillac’s design has thankfully hustled into the modern age since then, there’s still a portion of the ATS that irks me: the rear fascia. It’s more than just a toned-down look, it’s as if someone pinched the rear to a point and called it a day. It’s not so insulting as to ruin the overall physique, but it feels lazy for a luxury brand that’s hunting for the upper echelons of legitimacy. 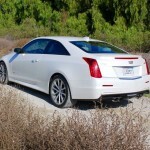 Now that we’ve established how the ATS-V speaks softly, let’s analyze that giant proprietary stick. 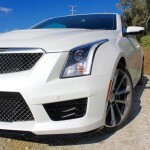 The ATS-V debuted in late 2014 with the automaker’s brand new motor, a 3.6-liter twin-turbocharged V6 churning out 464 horsepower and 445 pound-feet of torque. 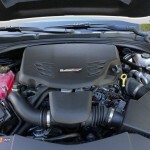 By comparison, BMW’s M3 also makes use of a forced induction six-cylinder, though is down about 40 hp to the Caddy. Mercedes-AMG offers two stages of tune for its C63 AMG’s bi-turbo V8: 469 horses or 503 (in “S” designation). While Mercedes-AMG offers more power, only BMW and Cadillac will let you choose a six-speed manual transmission. Mid-pack on grunt, you might assume the C63 AMG S outshines the ATS-V in straight-line speed. Not so. 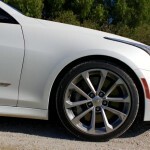 Cadillac’s coupe rockets to 60 mph in 3.8 seconds when paired with an eight-speed automatic, precisely on pace with the lighter M3 and more powerful Mercedes-Benz. 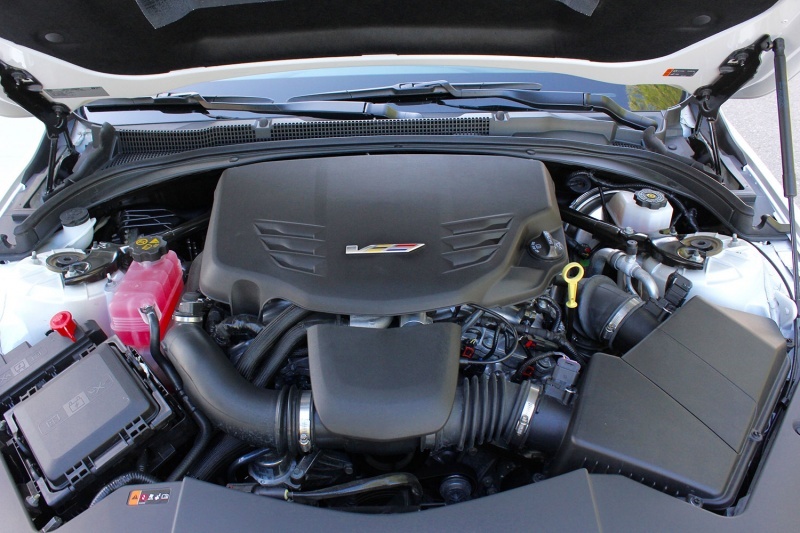 With minimal lag from Caddy’s forced induction unit, there’s at least some grunt all over the powerband and a hoarder’s garage full of it above 3,500 rpm. My tester came equipped with a manual gearbox and steering wheel-mounted paddles that initiate the ATS-V’s active rev-match feature – a handy tool for those who have yet to master heel-toe downshifts. Gear changes are crisp, communicative, and brief – the perfect combination for a sports car that’s factory-furnished for track duty. 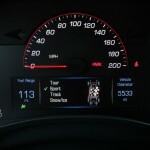 Speed comes like an allowance from rich, emotionally-detached parents. Unlike a spoiled adolescent, however, the Cadillac knows how to apply its endowment without hurtling into calamitous misfortune. That’s where the aluminum Brembo brakes, Magnetic Ride Control, and Michelin Pilot Super Sport tires come in. You’d swear the ATS-V was hiding the aforementioned Z/28’s Pirelli Trofeo R 305mm tires under its fenders by the way it grips through a corner. 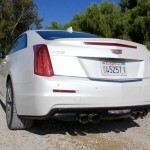 Incredibly balanced, the Cadillac darts into a bend with perfect accuracy and doesn’t flinch as the world melts around the coupe’s increasing pace. I double-checked the spec sheet to confirm the ATS-V employs an electric steering system, because feedback and weight are every bit as satisfying as a manual unit. 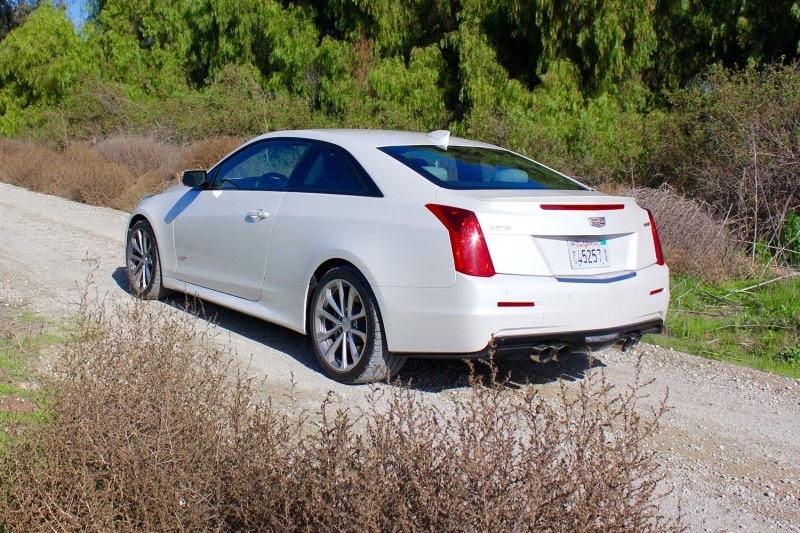 And before you get to that next curve in the road, the ATS-V will bring you to a halt with consistent braking bite. Then there’s GM’s infamous Magnetic Ride Control. It’s been praised a thousand times by now and I’ll gladly be the thousand-and-first individual to say it’s wondrously good. Cruising about in touring mode, it’s easy to forget how quickly the system can tighten up like a nerd who’s about to receive his daily wedgie. 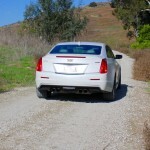 Sport and Track modes unleash the ATS-V’s potential, but come with a significantly harsher ride. Whether you’re a no-pulp or extra-pulp kind of guy or gal, you’ll still enjoy dialing the powertrain out to its 6,500 redline as the assimilated tune of turbo whoosh and V6 burble fill the cockpit. I’d love to cap the review there, but I did promise to do more than simply echo accolades to the car’s performance. 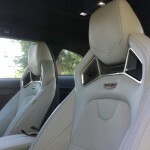 Alas, inside the ATS-V’s cabin are both merry surprises and disconcerting ones. 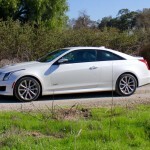 With modest restraint regarding the ATS-V’s options list, the super coupe just nestles on the underside of the $70 grand mark – a considerable chunk of change, though thousands less than its rivals. For that price, there are certain expectations about the level of interior refinement. 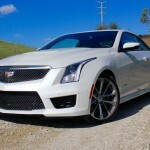 Where the ATS-V routes the competition is its optional Recaro sport seats. Worth every penny of their $2,300 asking price, the multi-way adjustable, heated buckets defy logic by blending long-haul comfort with track-hugging grip. Not once during several protracted drives did any part of my rump go numb, and in every bend I was glued to the seatback like a Lucha Libre was pinning me down. Rear seat passengers also benefit from comfortable, supportive seats and generous legroom. 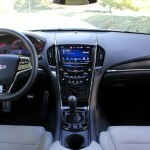 To my surprise, I actually enjoyed using Cadillac’s updated CUE infotainment system. Though initially a bit tedious to operate (due to a lack of physical buttons), I quickly adapted to its electrostatic controls and touchscreen layout. Sadly, the crisp display is paired with a dull driver instrument cluster, which feels like a carry over from too many models ago. The remainder of the interior has flashes of refinement, but leaves an overall impression of discriminate luxury. 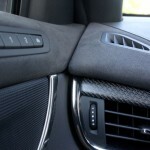 Alcantara trim on the dash, seat backs, and door panels stand out next to budget plastics elsewhere. And while piano black trim looks great while clean, two days later, dust has clung to it with The Terminator’s resolve. Having experienced the latest CTS and CT6 interiors, there isn’t a doubt that Cadillac is on the right track, and eventually its more premium models will lend their interior splendor to the ATS, but for now I’m left wanting the class of a German cabin. 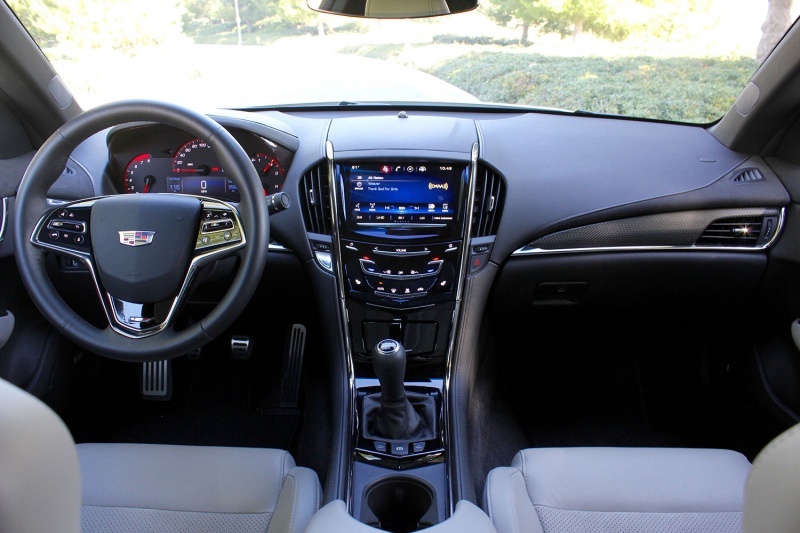 The 2016 Cadillac ATS-V is a brilliant car – a class-leading performer, a handsome coupe, and a thrilling secret for those in the know. I was concerned that my love of the car’s high-speed achievements would be tainted by underwhelming road manners. Despite the need for greater attention to detail in the cabin, the ATS-V emerges as a confident alternative to the established players from AMG and M.
Badge snobs need not apply, but ATS-V owners will be regarded as prudent, not cheap.